Do you want to be part of an innovative, passionate and dedicated team? Join us in our mission to save lives at Essex & Herts Air Ambulance. Volunteers are valued members of the team at EHAAT. They help at our offices, in our Charity shops and at fundraising events. As well as making a difference by supporting the Charity’s life-saving work, Volunteers get the satisfaction of being part of a group of people who are supporting the same cause. Charity volunteering is a great way of showing prospective employers that you do something meaningful in your spare time. As well as using your existing skills, you can gain experience, uncover hidden talents and meet new people. You’ll be given training appropriate to your role, and you will learn about how EHAAT is run and the work we do before you start. Our current range of volunteer opportunities is listed below, with details of what each role involves. Whether you are able to help regularly every week, or just occasionally, the Volunteer Team would be pleased to hear from you. We are looking for volunteers to assist our Shop Managers and Assistants in our Charity Shops. Giving any other assistance in relation to the smooth running of the shop as may requested by the Shop Manager. We fit ourselves around you. However ideally we would like you be able to cover 2 or 3 shifts a week. Our Charity Shops are located in Mersea, Burnham, Ware, Royston, Hitchin, Frinton-on-Sea and Buntingford. We are looking for fantastic volunteers to attend various events in their local community to help raise much needed funds and awareness. We are looking for volunteers to help us transport materials to and from events as well as assist in setting up and dismantling equipment. Collecting merchandise boxes and equipment (gazebo, tables, chairs etc) from our office and delivering these either to an event or to another volunteer. Assist with setting up at the event and help with the erection of the gazebo. Return at the end of the event to help pack away and dismantle equipment. Return merchandise and equipment back to the office. This role is flexible with hours to suit however assistance with events is normally needed on a Friday, Saturday and Sunday. Based in and around your local area. 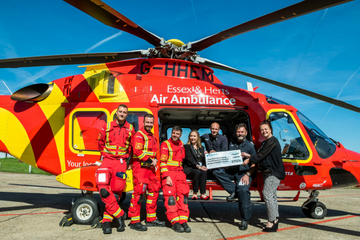 Strictly Air Ambulance and Motorcycle run, among many others – all help to raise much needed funds and awareness for our Charity. This role is flexible and we will fit ourselves around you. Based in and around your local area. Our Events take place in various locations throughout Essex and Hertfordshire. We are looking for confident public speakers to deliver our presentation at various events in the local community. We are looking for confident individuals to give guided tours of our Visitor Centre’s based at our Airbases in Earls Colne and North Weald. Raise awareness of the Charity and inspire groups to support EHAAT, through fundraising etc. This role is flexible however the tour usually lasts for around 2 hours. Visitor tours can take place any day of the week, with the exception of Tuesday and Friday. Ideally we would like you to commit to at least one tour per month. Our Airbases are located at Earls Colne and North Weald. We are looking for volunteers to distribute, collect and monitor our collection tins in the local community. Deliver collection tins to the agreed locations and ensure necessary paperwork is completed. Follow up on tins 2-3 times a year, or when required, to assess whether they are full and need collecting and replacing. The role is flexible and we fit ourselves around you. You can take on as many tins as you feel you can manage. We are looking for a volunteer to help us build relationships with Primary and Secondary schools in Essex and Hertfordshire. Working with schools gives us the opportunity to engage with children, to educate them on the work of EHAAT and the importance of fundraising, thus increasing revenue for the Charity. We are seeking volunteers who can commit to a minimum of two visits per month. Presentations could take place at any point during the school day. We are looking for volunteers to help organise stock in our Warehouse. Giving any other assistance in relation to the smooth running of the warehouse as may requested by the Warehouse Manager. We are looking for a Volunteer to assist our van driver.